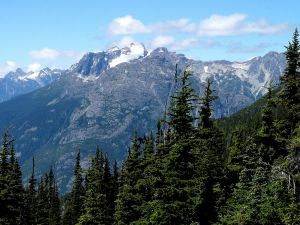 Located north of the Bella Coola River and west of Tweedsmuir Park, between Tseapseahoolz Creek and the Salloom River. 4 km N of Salloomt Peak. The peak is a steep rocky peak with an incredible cliff on the north face. The peak has two parallel south ridges, with a glacier between them. The highest point is not marked with a spot height, but a nearby subpeak is marked as 7276 feet on old 1:50,000 maps. There is a 2 km long lake just east of the peak.